America’s Funniest Comedians Volume 1 features the legendary stand-up acts of Jerry Seinfield, Brad Garrett, Kelsey Grammer, Adam Sandler, Max Alexander, John Caponera, John Ferrantino and Judy Tenuta in some of their greatest comedy moments. 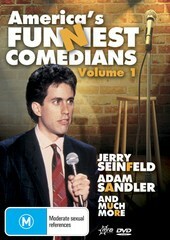 It should also be noted that this disc contains footage from the early careers of some of America’s funniest comedians before they made it big in Hollywood such as Seinfeld, Grammer and of course Adam Sandler. This disc contains 61 minutes of entertainment from start to finish that I would highly recommend to anyone who enjoys these comedians or for those that wish to laugh from start to finish, highly recommended! The only downside to this DVD is the video and audio quality that was before high definition televisions and Dolby Digital 5.0 as a standard. Still great value for the extremely entertaining content!